This is a painting that I always return to whenever I visit The National Portrait Gallery in London (which is at least twice a year). I wouldn’t say that the artwork is innovative or imaginative in any way. It is not some exceptionally unorthodox artistic device which moves me: it is the subject matter. Sir Ernest Shackleton is one of my big heroes and I have read many books about his life. His epic boat journey in the Antarctic to save all of his crew after they had been stranded in the ice for over a year is one of the great survival stories of all time. 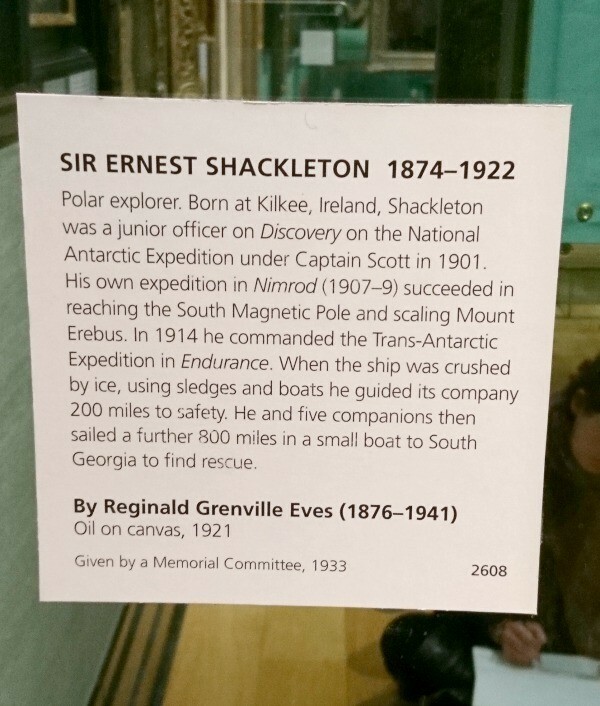 I strongly recommend that you find out more about Shackleton – his story might just amaze you. When I stand in front of this portrait (which is in the permanent collection of The NPG), I attempt to look deep into the subject’s eyes to see if the artist somehow captured the essence of the man that tells of the suffering he endured in the South Pole. By all accounts, Shackleton was extremely charismatic and possessed a magnetic personality that few could resist. Despite his success at not losing a single man’s life on his expedition against all the odds, he never achieved the fame, riches and recognition that he so deeply desired. Additionally, Shackleton sat for this portrait only a few months before he died of a heart attack at the age of 47, which was attributed to the extreme stress of his earlier expedition. 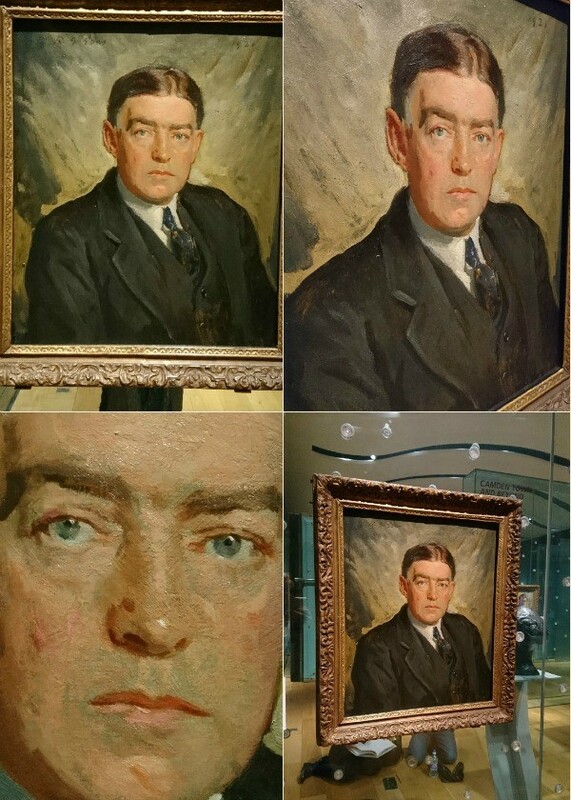 So, every time I gaze into the painting, I am searching for clues, or some intimation in Shackleton’s posture and facial expression, that may reveal a sadness or betray deep regrets, which could have contributed to his premature death. If Reginald Grenville Eves had opted to paint in any other style than such a realistic manner of portraiture, I would not be able to indulge in this investigation, so I am more than happy that the piece is not too “arty”. However, the choice of light colours, paired with heavier and clunky brushstrokes surrounding the lower part of the head, draws the viewer in, focussing solely on the weathered face and piercing eyes. The effect is perhaps that of a fallen halo that rests somewhere around the shoulders. Was this the artist’s message implying that this once enigmatic character was at this point in his life a beaten man? A painting does not have to push the boundaries of all that has come before to attain artistic worth. The fact that this melancholic painting pulls me back for repeated viewings means that it is a piece of art that I would like to own, as I could stare at it for hour after hour and still remain engrossed.